The Week in HD – Monday 28th April | What Hi-Fi? Oathkeeper. While remaining largely faithful to the books, Game of Thrones has had to adapt for the sake of a TV audience and brevity (those books are huge). There are events in this episode, however, that don't appear in the books at all, and it will be interesting to see the show carve its own distinct path. Daenerys learns how to be a fair and feared conqueror in Meeren, while Jaime tasks Brienne with finding and protecting Sansa Stark. We find out what the mutineers have been up to at Craster's Keep, while Littlefinger finally emerges from the shadows and gleefully sees his plans set in motion. In the series three finale, St Saviour's closure has left Adam open to a change of career. He's determined to become a management consultant, but will he be able to leave behind his vocation and the people of his parish? When a magician decides to become an FBI informer, the mob orders a hit on him. With a large bounty up for grabs, an ensemble cast of eccentric and violent assassins face off each other in a film full of twists and turns and chainsaws. Champions League Semi-Final, Second Leg. The German champions return from the first leg in the Spanish capital with a single goal deficit to overcome if they are to keep hopes of a second successive Champions League title alive. No Lack of Void. When a pickpocket dies of anthrax poisoning, Holmes and Watson race against the clock to stop an epidemic from taking over New York City. The 60 hopefuls have been whittled down to just 10, but the pressure is ramped up as we enter Knockout Week. Not only are the first five contestants sent to work a lunch service at a busy London restaurant (where last year's MasterChef: The Professionals finalist Adam Handling is head chef), they also have to endure a final invention test – that will be judged by the fearsome two-Michelin starred chef Marcus Wareing. One contestant will get the boot. Field Trip. Don is invited back to work, but reluctantly so and under strict conditions. Betty's relationship with her children is further strained, but meets an old friend for lunch. Nature Under Constraint and Vexed. Orphan Black is back for a second series! For those who haven't seen it yet, we'd urge you to put this at the top of your watch list. And catch up with the first series on BBCiPlayer. What's the story? 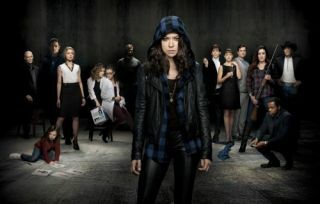 Sarah Manning is a troubled young woman with a shady past but with a half-brother and a young daughter that she adores. She's on the path of going straight, but finds out that she isn't alone. She has clones. Lots of them. Oh, and they're being killed off one by one. It's a brilliant series, fuelled by the incredible talents of the lead Tatiana Maslany, who shifts seamlessly from tough girl Sarah to prim but tense housewife Alison; from the hipstery PhD student Cosima to the psychotic Helena – seriously, there are a lot of clones. Slice of Death. Warning: this episode will make you crave pizza, despite the fact that a corpse is found inside a pizza oven. The rivalry between warring neighbourhood pizza places has resulted in the dead reporter, but who did it? Knockout Week sees another five contestants pushed to the limits as they tackle a busy lunch service, but we reckon it's preferable to being on the receiving end of harsh criticism from Marcus Wareing. He's reduced people to tears before, and we wouldn't be surprised if it happened again when one more contestant leaves the competition tonight. A moving, intimate and riveting documentary about the life, career and death of Formula 1 driver Ayrton Senna. Worth a watch even if you don't watch (or like) F1. Providence. With only four episodes left to go, the Marvel show continues its new-found streak of confidence and awesomeness as the team gears up to fight Hydra and its operatives. Patton Oswalt guest stars. The final eight only have one challenge tonight: cook an exemplary dish in one and a half hours that will ensure only six of them a place in the semi-finals. Regulars Ian Hislop and Paul Merton are joined by Charlie Brooker and Bridget Christie on the panel, with Jack Dee on guest host duties for the night. With X-Men: Days of Future Past heading to our cinemas in a month's time, the film's three major stars – James McAvoy, Michael Fassbender, and Hugh Jackman – share anecdotes about filming the sequel and what's in store for their characters. They're joined by Molly Smitten-Downes – our Eurovision hopeful for this year. Yep, Eurovision 2014 is looming like a large, hulking glitterball. 10th May. Save the date. Barclays Premier League. With the season drawing towards its close, Tottenham will be hoping to keep their lingering hopes of European football alive, while West Ham will be going in search of a third successive win against their London rivals. Barclays Premier League. Arsenal come into this game looking to secure Champions League football for yet another season, but could face a tough test from a West Brom side on the verge of securing Premier League football for another campaign. It's the final of the 2014 championship, with Hazel Irvine presenting live coverage from The Crucible. Will five-time winner Ronnie O'Sullivan hold on to his title? Spanish Grand Prix. The Jerez circuit will be a home race for many a Spaniard on the track, but all eyes will be on the simmering battle between Marc Marquez and Jorge Lorenze for top spot.